Should Airlines Pay TSA Screeners and Air Traffic Controllers During the Shutdown? 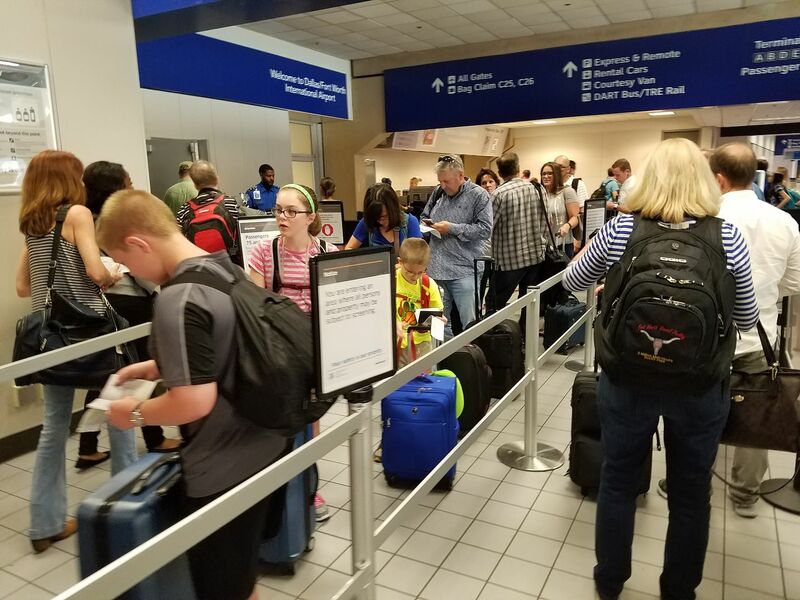 Security wait times have increased as TSA screeners call in sick — coming to work not knowing when they’ll be paid is demoralizing. Air traffic controllers are working without knowing when they’ll be paid, too. But is there any reason that has to be so? Matt Young effectively asks, should US airlines hire the screeners and air traffic controllers and pay them directly? Airports can have private screeners following TSA protocols, instead of federal screeners. However the TSA has to approve it, which they won’t while the government is shut down (there has been a monumental bias against it to begin with). Air traffic control is also a function that’s performed privately at some airports, controllers are represented by the same National Air Traffic Controllers Association affiliated with the AFL-CIO. There are rules against certain federal employees having outside employment. All of these objections make sense in the event of a short shutdown, but things have gone on and it’s not obvious when the shutdown ends. We’ve seen the federal government bring back aircraft inspectors and make payments to TSA employees that hadn’t been originally planned. Extreme measures are possible. Would US airlines do this? It would demonstrate they can pay for airport security and air traffic control, that they can manage these processes themselves, and so there’s little reason for the government to do it for them. It would mean they could take responsibility for their own businesses. They’d rather have taxpayers fund it. On the other hand most US airlines have favored spinning off air traffic control to operate as a non-profit just like in Canada, where costs are lower and technology investment better. And airlines only signed on to the TSA boondoggle on the belief in exchange the Air Transportation Stabilization Board would dole out billions in subsidies. Here’s American Airlines CEO Doug Parker, then of America West, asking Congress for subsidies after 9/11. Have we gone too far down the road of government paying for everything? Or could we return to having screeners at least paid for by the airlines (through third party contractors, no doubt)? Cut out the middleman and let the airlines do it by hiring a private third party security company. Govt controlled TSA is there just to prevent liability to the airlines if they screw up and a plane goes down. It’s not taxpayer funded (maybe the fluff is) as EVERY passenger pays 5.60 per leg or the privilege of being scanned which has a huge failure rate of detection. Maybe security would improve and service would be better by keeping HS out of it. The airlines can then make a profit from the income from fees collected vs the expense of hiring the job out. It’s not taxpayer funded (maybe the fluff is) as EVERY passenger pays 5.60 per leg for the privilege of being scanned which has a huge failure rate of detection. Maybe security would improve and service would be better by keeping HS out of it. The airlines can then make a profit from the income from fees collected vs the expense of hiring the job out. I presume TSA employees are government workers with all the rights (or perks, some might argue) that other government employees have. Farming it out to the private sector, i.e. for profit, would be a backward step for employees and the pocket of air travellers. National security is best performed by the government and should TSA workers remain employees of the U.S. Department of Homeland Security. What we can and should do is pressure the obstinate Republicans in the U.S. Senate to vote on ending Trump’s shutdown by voting to fully fund and reopen the government. When that is done, we should consider replacing Secretary of Homeland Security Kirstjen Nielsen with someone more qualified who has both the skill and the commitment to give the TSA workers the cutting edge technology they need to do the job. I think it would be a good idea to completely get rid of the TSA and have the airlines in charge of their own security. I guarantee you that Delta (or any other airline) would do a much better job than the TSA and would be much friendlier. It would be terrible for an airline if they had a security incident so you can bet they’d be thorough. Hell, I would say just shutdown the airports while the government is on recess. If Trump wants to keep throwing a hissy fit, then everything should be shut down, FAA + TSA included. I don’t think we’ve gone too far down the road of the government paying for everything. It’s important to keep people safe and protect the most vulnerable. I think there’s a lot more the government could be doing. Government is unforgivably inefficient. TSA workers at minimum wage cannot reliably protect you! (They would if they could, but they can’t…the capabilities aren’t there.) I’m horrified at the billions of dollars spent paying TSA workers each year to make a show of x-ray-ing you. Smaller govt is better. And the TSA workers are obviously subject to morale problems,… if they call in sick when not sick, fire them. Sick leave is for sick people, not lazy people. What did Mother, the computer in Alien, say when Ripley kept asking for help? “Insufficient data” or something like that. Ditto. One point to consider…federal employees do not go on strike. Consider the fact that in reality, all passengers already pay for TSA yet the airlines control the process. I really enjoy bypassing lines when I am travelling in a premium class but the process is not fair because every passenger pays the same fee. Yes, airlines should run the security and pay their way. If we don’t care about border security, why do we care about airport security? Why not get rid of TSA entirely? If anyone who wants to come into the country can do so unscreened without knowing anything about them, then anyone should be able to do the same to get on a plane. The last thing We need is for-profit screening and air traffic control. Ranger… I have thought about it and we need private contractors paid by the airports/airlines. These already exist at many major airports and they certainly don’t do any worse than TSA. There would still need to be government oversight to ensure minimum standards are met, but at least we wouldn’t be in the position we are now. Government doesn’t exist to provide employment and it has repeatedly shown it is less efficient than the private sector. Do you really think the VA, IRS, DOE, et al are the paragon of competency? If Nancy and Chuck would stay in Wash.D.C. and negotiate we will have TSA and Air Traffic at full force…. If enough flights are cancelled then I bet the airlines will kick in money to help cover the cost for the workers.